Discussion in 'Diablo 3 General Discussion' started by Dorfoumous, Jul 29, 2010. When I was getting my copy of SC2, I begin to look at their little notebook of release dates. 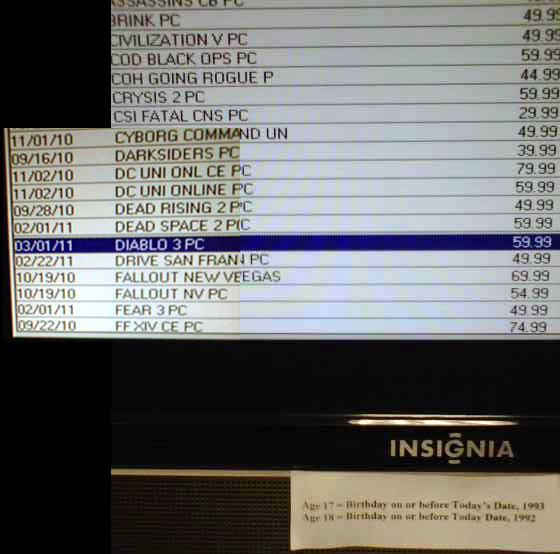 Went 360 and then to the PC section, and saw my beloved D3 with the release date of 12/31/2010. I asked the guy behind the counter and he said it was "official" and I offer no proof what so ever, and to be realistic, I don't believe it either. I've "scoured" the internats, and came up with nothing, other than what I saw in the store. The only thing, I can say is, Gamestop was right about SC2 coming out they had the July release date for Sc2 in like Jan of 2010. So.. maybe its "official?" has anyone else heard anything? I won't hold my breath, but uh. Really? 12/31? that like 4 months.. If it is true, it will probably be pushed back, I was wondering if anyone else has heard of anything. Just a placeholder until Blizzard announces the real release date. 2011 is a good bet, but it really depends on how the game looks when shown at this year's Blizzcon in October. A 2012 release wouldn't shock me. As ThomasJ said, no one but Blizzard has any idea, and they're not telling us. There is no release date, and game retailers just announce them in an effort to spur pre-sales. I just updated the release date article in the wiki with a bunch of relevant links and images; it should answer any lingering doubts about this perpetual question. not a starcraft fan (i know i know) so i was not aware of this. man i would love that mainly since i will preorder anyway. at what point was this offer made though? near the start or end of beta? We are aware that your order for the item(s) below is still outstanding and apologise that this has not yet been sent. We remain in contact with our suppliers and will keep you updated as soon as we are able to send the item to you. Once again please accept our apologies for the extended delay in sending your order and do not hesitate to contact us at customer services colleagues if we can be of any further help. It's like, I know it won't be coming in the next 12 months or so, a copy+paste email won't make me feel any better about it. Saw this at gamestop today, it was posted all over the store. 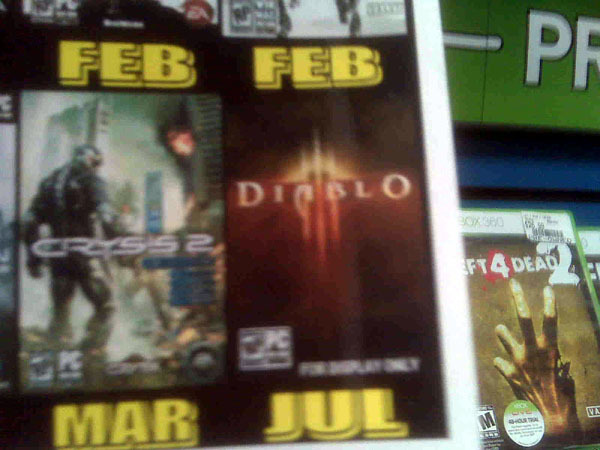 It is from my phone so low quality, but says July for D3. Similar to this rumor above. Don't wait... Preorder now. I did. Any collector's edition is a given on a first-come, first-served basis. So it will only help to get your name on the list. It's worth the $5 downpayment. The manager at the Gamestop I go to said there were already about 40 people who prepaid. And that was in July, I think (whenever Lego Harry Potter came out*). For now, it's a fake posting, probably based on the fact that StarCraft 2 was released in July. Blizzard never gives out info on release dates until a few months before it. so my guess is nobody really knows when it's ready. Yeah, I don't know that I think Gamestop knows anything either but certainly they have that posted up all over the store. I guess I thought posting it meant they were at least somewhat more confident (or more public) then just someone taking a cell phone picture of the release date in a computer. This was a gamestop in Hazleton, PA at the Laurel mall if anyone is near there and wants to check that out. It's quite possible this is real. July IS like 9 and a half months away. And if they are almost at the polishing stage, this bodes well. Most people are expecting a 2011 release. It's quite possible this is real. July IS like 9 and a half months away. If by "real" you mean "just a guess that may turn out to have been correct" then you're right. It is by no means a planned release date handed to Gamestop by Blizzard. Or maybe just MAYBE! they're announcing a beta start date at Blizzcon, and have sent out est. release dates to major distributors. I know it's wishful thinking. That gamestop in-store display is funny, since back in August their internal inventory system said March 2011. Don't you hate when fake release dates get delayed?